Well, we have largely struck out again when it comes to newborn cloth diapering. Mike and I must make babies with really odd shapes because the majority of our diapers just don't work well on our wee ones. Leaks here, blowouts there, it just wasn't worth the frustration and piles of poopy laundry so we have mostly used disposables on Aurelia. Until...we received the cutest cloth diaper ever from Melissa of Bubalooch: modern cloth diaper parties! Tell the whole story: Teach about the performance benefits, and help dispel the notion that cloth diapers are difficult and messy! Offer A Hands-On Approach: Bubbaooch parties give parents a chance to see modern cloth diapers up close and learn about all the different systems. Newbie Kits are available to let parents try a few diapers before deciding which systems best fit their lifestyle. Make It Easy: The selection of cloth diapers can be overwhelming. Some are great and others are to be avoided. Bubbalooch only partners with the best brands. 1. The only cloth diaper that didn't leak after 1 hour. It actually didn't leak at all even at 3.5-4 hours during the day (I dared not test it beyond that). 2. The only cloth diaper that didn't experience a massive blowout. 3. The only cloth diaper that could actually fit in her normal clothes. The other brands required that I put her in 6 Months instead of her usual 3 Month outfits. This diaper is really trim compared to the others. The Newborn Simplex is designed to fit the unique body frame of newborns & smaller babies (6-16 lbs). Aurelia is over 14 lbs. and we just moved to the last row of snaps. It looks like it will continue to fit her until close to 16 lbs. It is a unique diaper that combines the convenience of an all-in-one while providing the absorbent flexibility of a pocket diaper. It has a "tunnel-like" design that allows you to increase the absorbency by adding extra inserts, if you want to. This also enables any extra doubler or insert to agitate itself out in the wash. The result is a diaper that is thoroughly cleaned and dries fast. We haven't yet needed to add any inserts; the diaper as it is has worked just fine for us (no leaks with either #1 or #2) every time. It is made with a waterproof outer layer and 11 layers of 100% cotton birdseye fabric in the wet zone. Before we ever used the diaper, I questioned how on earth it would be able to handle a newborn's wrath. The fabric and diaper in general is so trim compared to our other bulky diapers. But? Somehow, it has managed to be our only leak-free and blowout-free diaper. Props, Swaddlebees. Above left: interior of the diaper with the attached insert outside of the diaper. 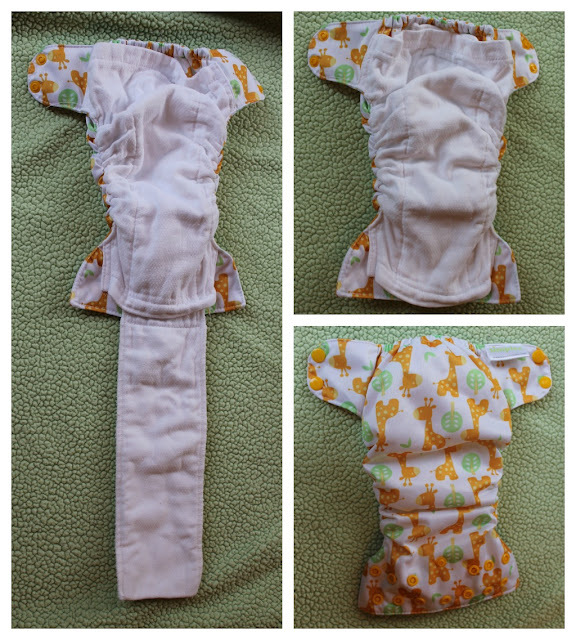 Top right: interior of the diaper with the attached insert inside the diaper. Bottom right: exterior of the diaper. Bottom line: I love this diaper; it's the first one I reach for when selecting a diaper for Aurelia. It's trim, it's absorbent, it has CUTE GIRAFFES. Done deal. Bubbalooch offers a number of cloth diapers, diapering accessories, and more! Free shipping on orders over $75 as well. If you're in the LA area, you can even host a cloth diaper party with Melissa. Melissa of Bubbalooch is SO GENEROUSLY offering one of my readers their choice of either the Newborn or Essentials kit in boy, girl, or neutral colors. This is a Rafflecopter giveaway. Click "Read More" below and then follow the instructions on the widget. All currents count! Giveaway is open to residents of the US. Ends at 11:59 PM on Tuesday, December, 11th. The first entry is mandatory - Visit Bubbalooch and tell me what product you'd like to try! Once you complete this entry, the widget will give you the option of completing the rest. Complete more steps for more chances to win!